Perched on a plateau west of the Andes on the Pacific coast is the driest non-polar desert on Earth. The Atacama Desert is a 600 mile long strip of otherworldly terrain of rocky hillsides, salt lakes, sand, and ancient felsic lava flows. 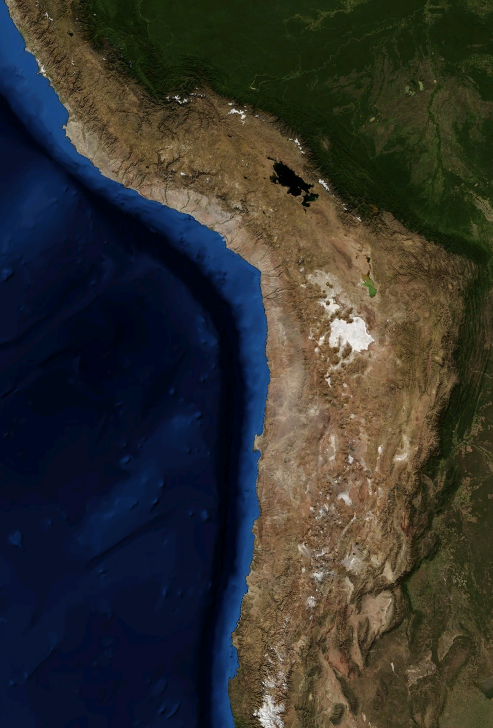 The hyperaridity of the Atacama has existed for at least 3 million years. It's the oldest continuously arid land on Earth. A few weather stations in the Atacama have never recorded precipitation. Mean rainfall ranges from 0.04 to 0.12 inches per year in the coastal towns of Arica and Iquique to 0.6 inches per year in the abandoned mining town Yungay. "Don't think about what you've left behind" The alchemist said to the boy as they began to ride across the sands of the desert. "If what one finds is made of pure matter, it will never spoil. And one can always come back. If what you had found was only a moment of light, like the explosion of a star, you would find nothing on your return. This year the Atacama is experiencing a rare springtime bloom. The Garra de León or Lion's Claw is a stunning red flower that's blooming in the Atacama. The Garra de León is a plant species exclusive to the Atacama Desert. 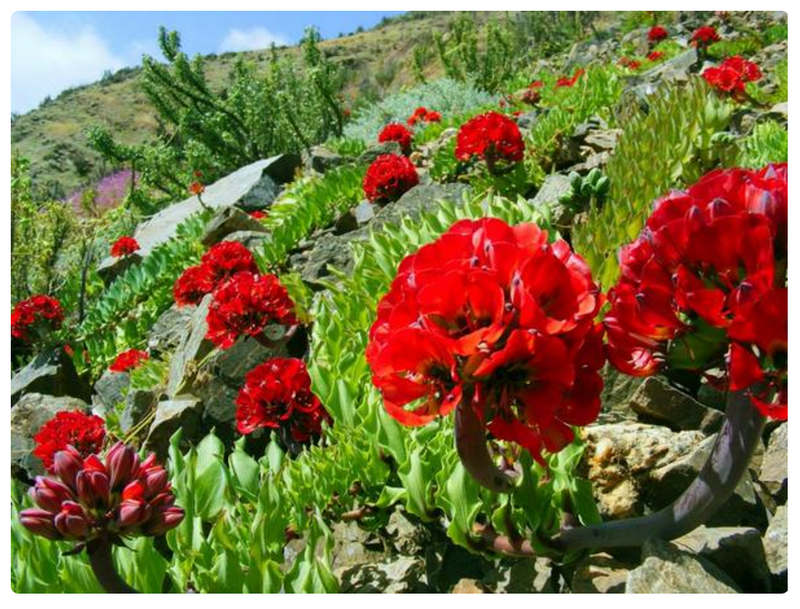 Historically a significant Atacama Desert bloom occurs every 5-7 years, but unusual March and August rains this year have produced cumulative precipitation not seen in nearly 20 years. "At the moment it is gently raining. Imagine these flowers tomorrow." Uncharacteristic rains have spawned a profusion of flowers. Seeds have germinated that have lain dormant for many years. Long before I ever saw the desert I was aware of the mystical overtones which the observation of nature made audible to me. But I have never been more frequently or more vividly aware of them than in connection with the desert phenomena. 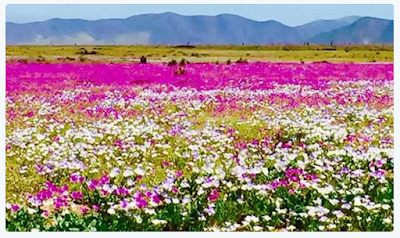 Flowers bloom in the Atacama desert – in pictures, The Guardian, 30 October 2015. 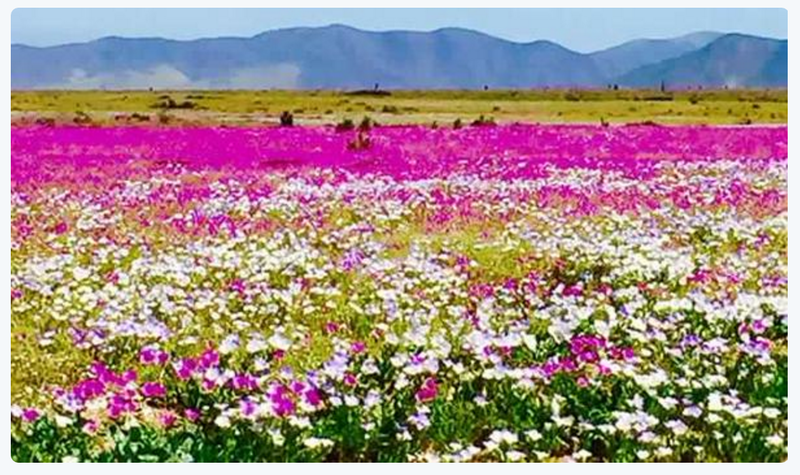 In Images: Stunning Flower Fields of the Atacama Desert by Tia Ghose, 29 October 2015. The voice of the desert : a naturalist's interpretation by Joseph Wood Krutch, 1955. Twitter feed of Tomás Cuadra Ordenes.